The following information is derived mostly from data obtained from the American Hospital Association (AHA), the Centers for Medicare and Medicaid Services (CMS) and California’s Office of Statewide Health Planning and Development (OSHPD). 1. 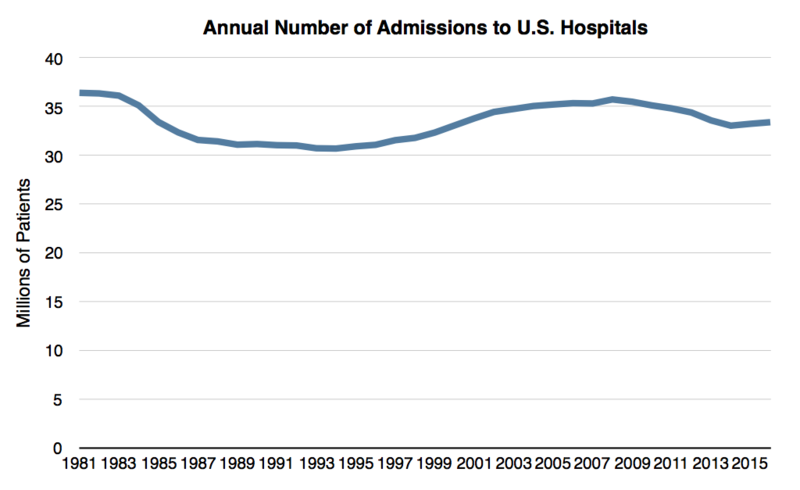 Inpatient censuses for U.S. hospitals have been steadily declining for nearly four decades. 2. Fewer Medicare and Medicaid patients are being admitted to U.S. hospitals each year in spite of the substantial increases in Medicare and Medicaid recipients. 3. Hospitals are providing far more outpatient services than in the past, largely to replace their decline in inpatients. 4. 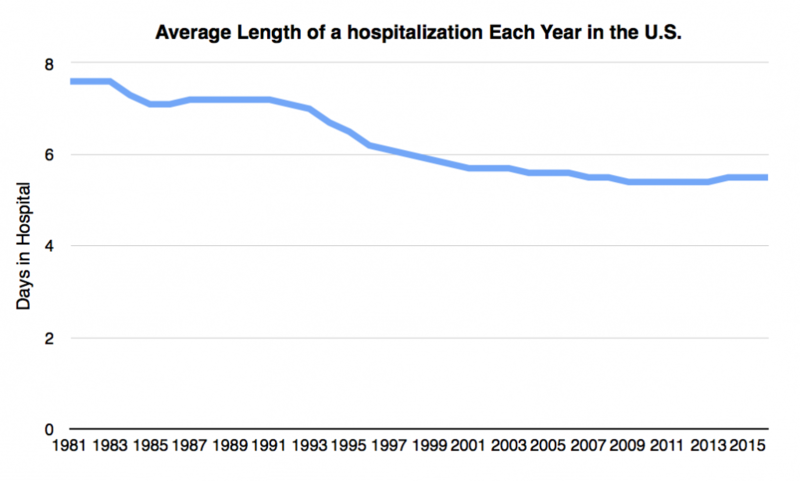 There are far fewer hospitals and hospital beds in the U.S. than there were in the 1980’s. 5. The total number of surgeries performed in the U.S., both inpatient and outpatient, hasn’t changed significantly since 2001 in spite of the fact that the U.S. population has both aged and increased. 6. Skilled nursing facilities (SNFs) have also seen a decline in their censuses in recent years. 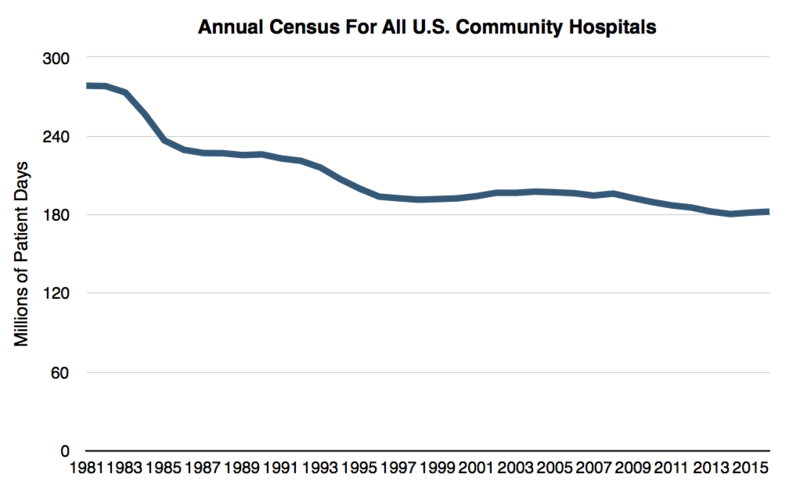 Figure 1: Hospital censuses for all U.S. hospitals have been declining since 1981. Figure 2: The total number of admissions to U.S. hospitals dropped significantly after the implementation of Diagnostic Related Groups (DRGs) as criteria for Medicare admissions in 1984. After rebounding slightly in the late nineties, they began to drop again in 2008. Figure 3: Even during the years that hospital admissions were increasing (1995-2008) hospital censuses only increased slightly, if at all, because hospital stays have continued to decline. The average length of a hospitalization in the U.S. has dropped from 7.6 days in 1981 to 5.5 days in 2016. 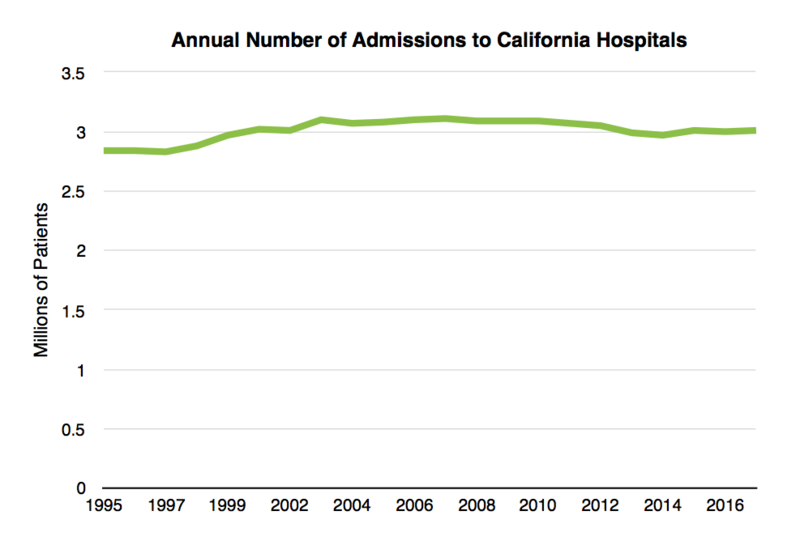 Figure 4: According to data from California’s OSHPD, the total number of admissions to hospitals in California has also remained quite flat since 2001. In 2017 about 3.01 million patients were admitted to California hospitals which is slightly fewer than the 3.02 million patients admitted in 2001. This shows that data obtained by the OSHPD for California hospitals largely concurs with the national hospital data from the American Hospital Association. 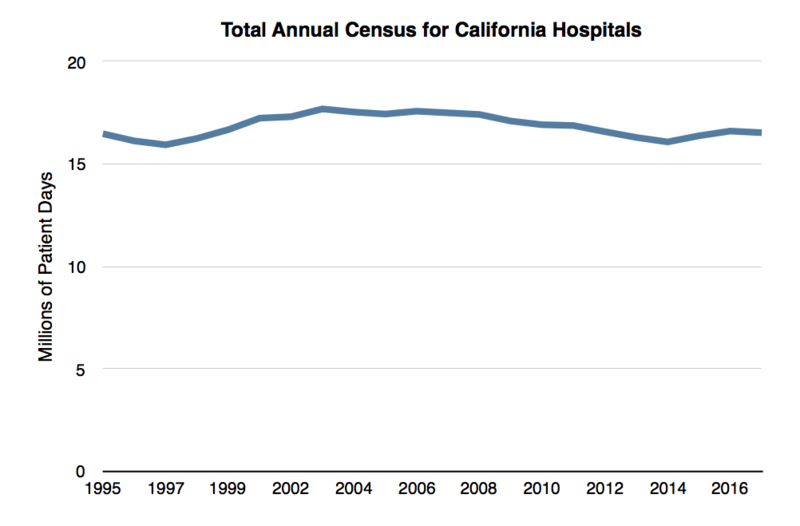 Figure 5: California hospital censuses followed national trends in that they were lower, on average, in 2017 than they were in 2001 since hospital stays have been decreasing. According to CMS data, admissions to U.S. hospitals for both Medicare and Medicaid recipients have been dropping in recent years in spite of the substantial increase in both Medicare and Medicaid recipients. Figure 6: Between 1996 and 2015 the number of people in the U.S. who received Medicare benefits increased by about 50% (yellow line). 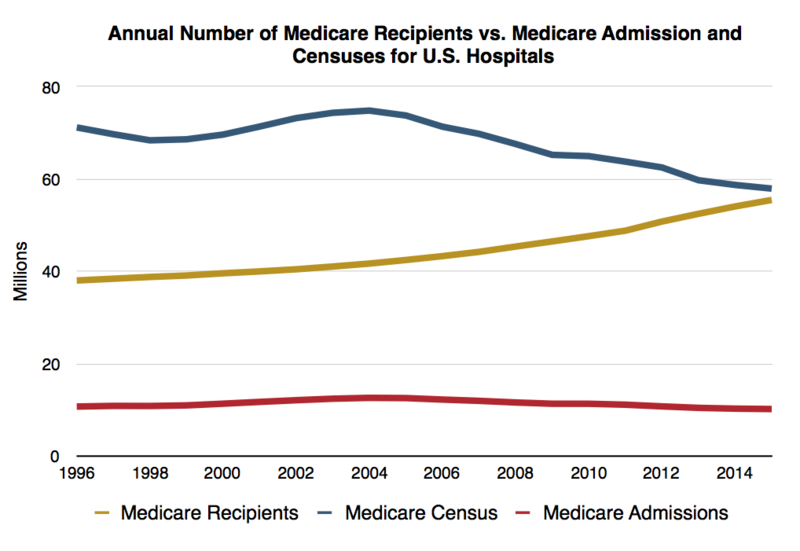 In spite of this increase, slightly fewer Medicare patients have been admitted to U.S. hospitals over the last decade (red line) and inpatient censuses (blue line) have declined substantially during that time. Figure 7 shows a similar trend for Medicaid recipients in the U.S. as for Medicare recipients. Figures 8 & 9 again show that data from the OSHPD for California hospitals concur with the national data from CMS for Medicare and Medicaid recipients admitted to hospitals. 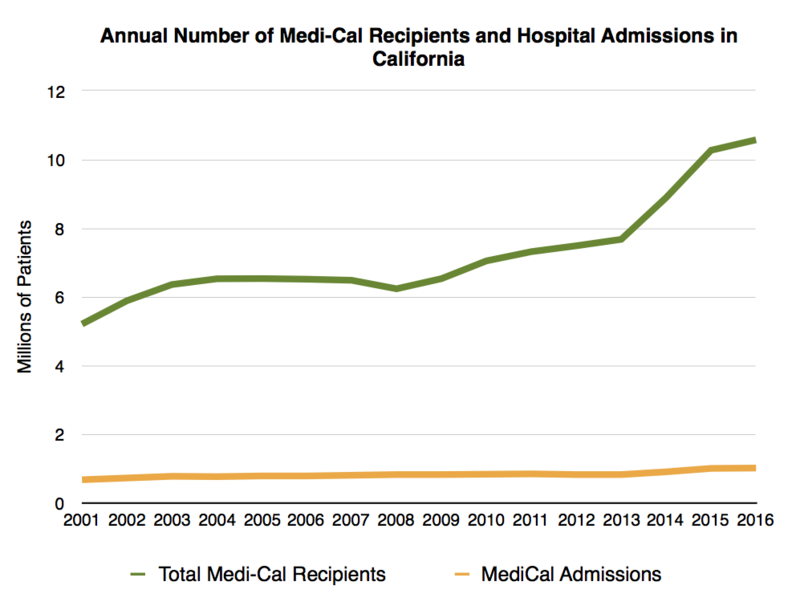 Figure 9 The total number of Medi-Cal (California’s Medicaid) recipients each year vs. Medi-Cal admissions to California hospitals. 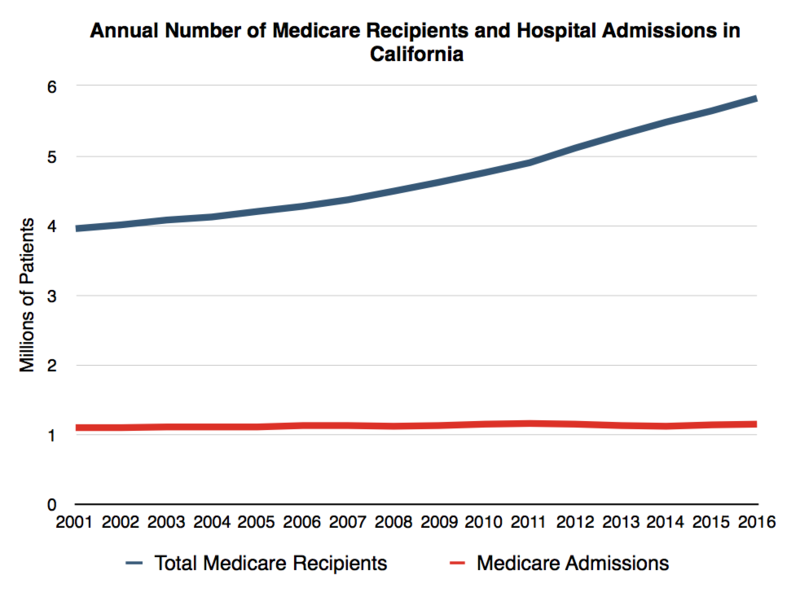 Medi-Cal recipients increased by more than 100% from 2001-2016. NB: According to this study done by Health Affairs in 1995, the total annual census for Medicare patients in U.S. hospitals was 77.2 million patient days in 1972 and peaked at just over 109 million patient days by 1980. In 2015 the annual census for Medicare patients in all U.S. hospitals was just under 58 million patient days. That means that there were fewer Medicare inpatients, on average in U.S. hospitals on any given day in 2015 then there were in 1972 even though there were more than 2 1/2 times as many Medicare recipients in 2015 then there were in 1972. 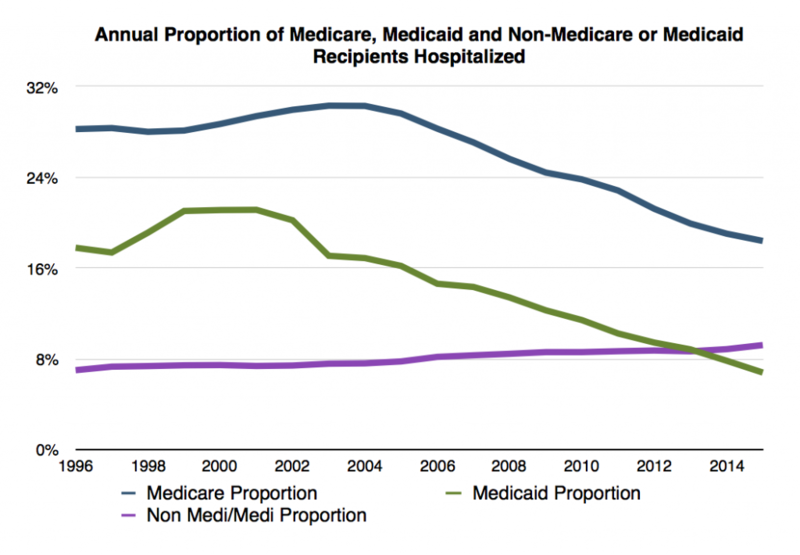 Figure 10: The obvious conclusion from the above graphs is that the proportion of both Medicare and Medicaid recipients being admitted to U.S. hospitals each year have declined substantially as figure 10 confirms. It should be noted that the proportion of non Medicare or Medicaid recipients (privately insured and uninsured, purple line) receiving inpatient care in the U.S. has increased somewhat over the same period of time. 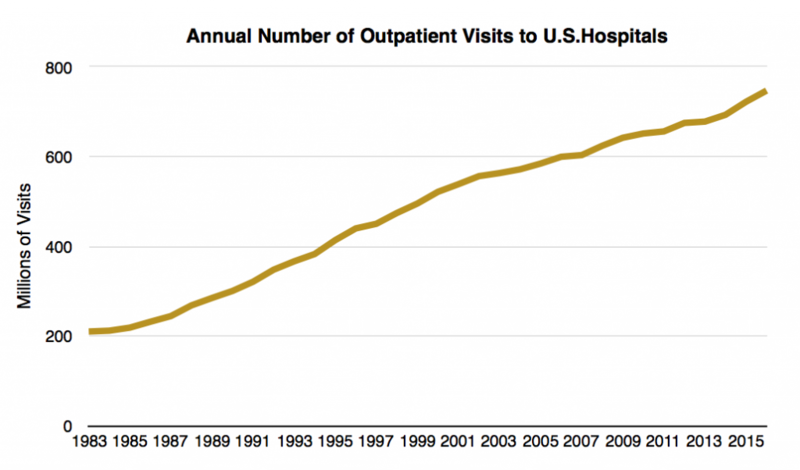 Figure 11: According to the AHA, the number of outpatient visits to U.S. hospitals have increased steadily each year for more than three decades. An outpatient visit to a hospital might include anything from a simple routine blood test or x-ray to an ER visit or outpatient surgical procedure. 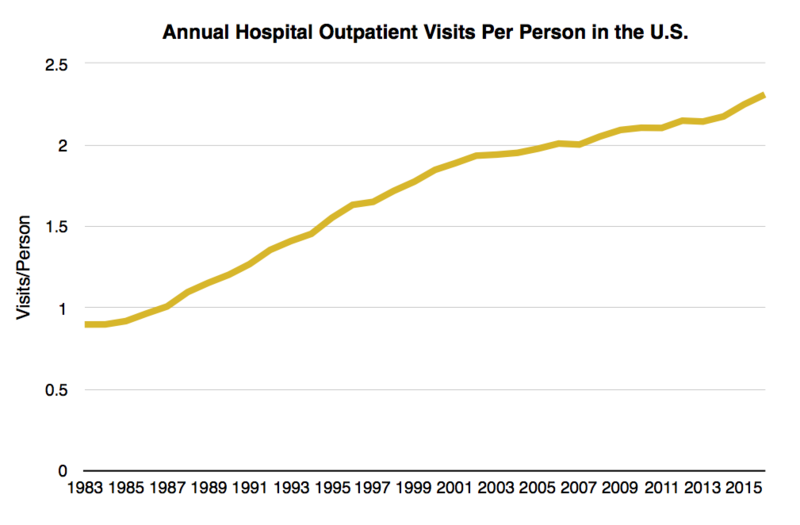 Figure 12: If you adjust figure 11 for the increase in the U.S. population you’ll see that the number of outpatient visits to hospitals per person in the U.S. has also increased, just not by quite as much. Figure 13 shows how the trend from hospital inpatient to outpatient care has affected hospital revenues. In 1981, only about 12% of the revenue hospitals received was for outpatient medical care whereas about 88% of the revenue came from treating inpatients. 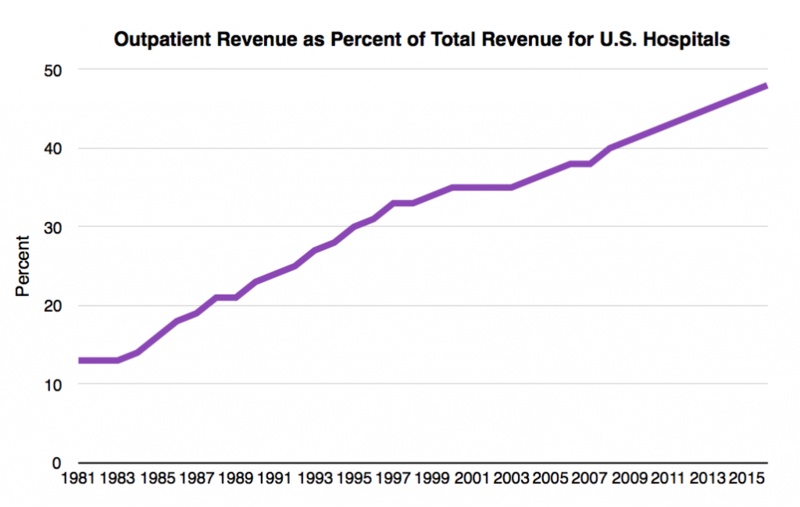 By 2016, nearly half the money U.S. hospitals received was for outpatient care. 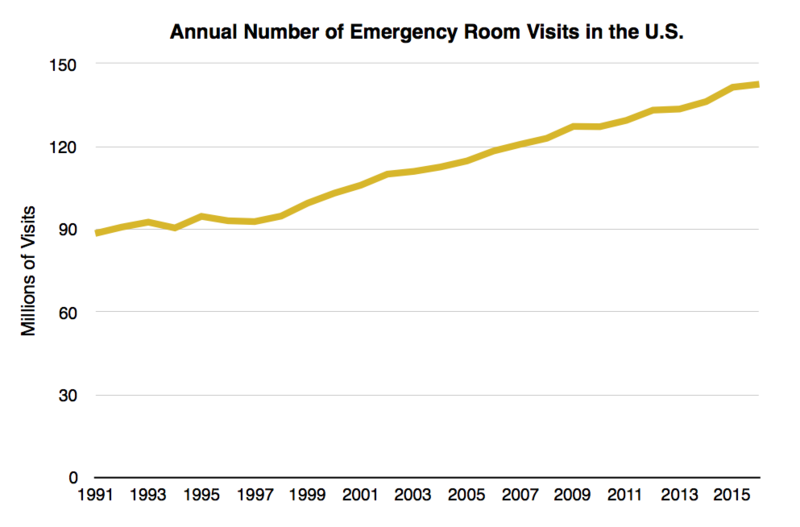 Figure 14: The number of visits to emergency rooms in U.S. hospitals has increased by about 50% between 1991 and 2016. 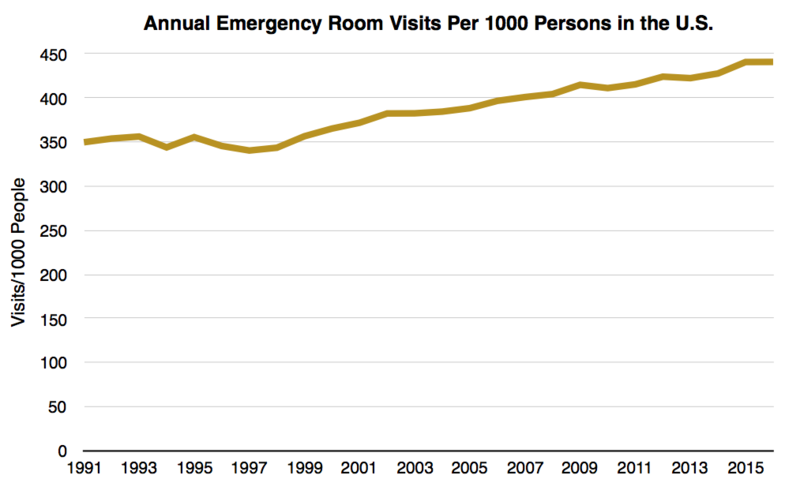 Figure 15: When adjusted for the increase in the U.S. population, the number of ER visits in the U.S. have only increased by about 26% per 1000 people, and most of that increase has been since 1999. 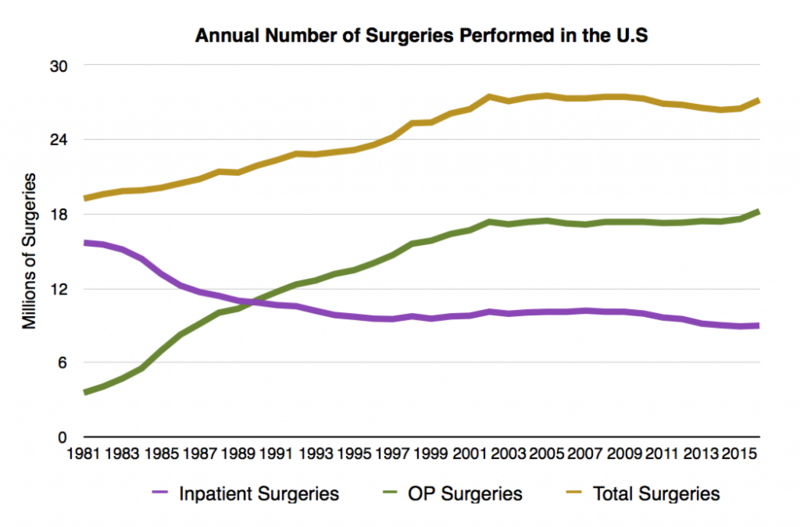 Figure 16 shows two very interesting trends in the number of surgeries performed in the U.S. First, not surprisingly, fewer people are admitted to hospitals for surgery each year (purple line) as more surgeries are performed as outpatient procedures (green line). More surprisingly, though, is the fact that the total number of surgeries performed each year on both inpatients and outpatients (yellow line) has been flat since 2001. This data has not been adjusted for either the increase in the U.S. population or the increased median age. Surgeries in the U.S. are performed less frequently per person in the U.S. over the last 15 years. 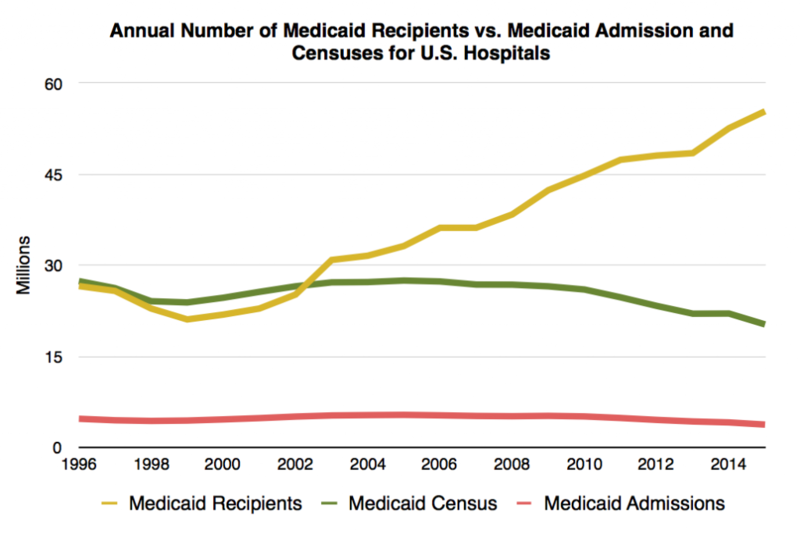 As you might expect, a drop in U.S. hospital censuses would cause a decline in the number of hospitals in the U.S. 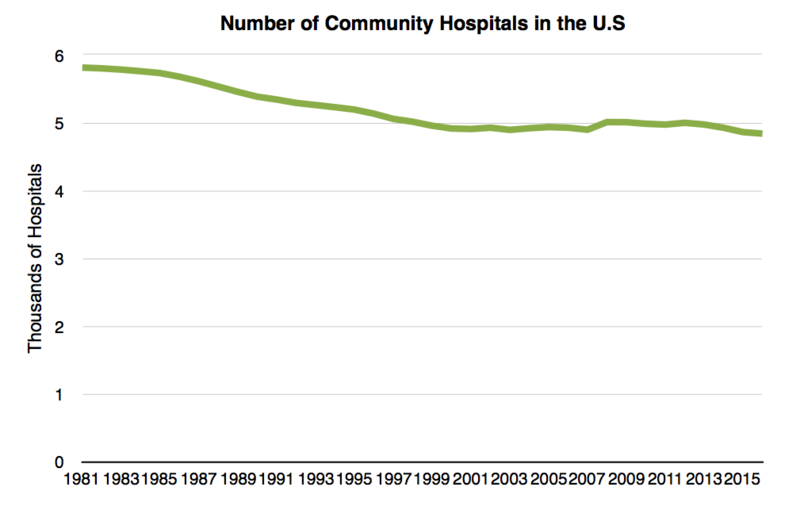 Figure 17: There were about 1000 fewer community hospitals in the U.S. in 2016 then there were in 1981 which is about a 17% drop in the number of hospitals. 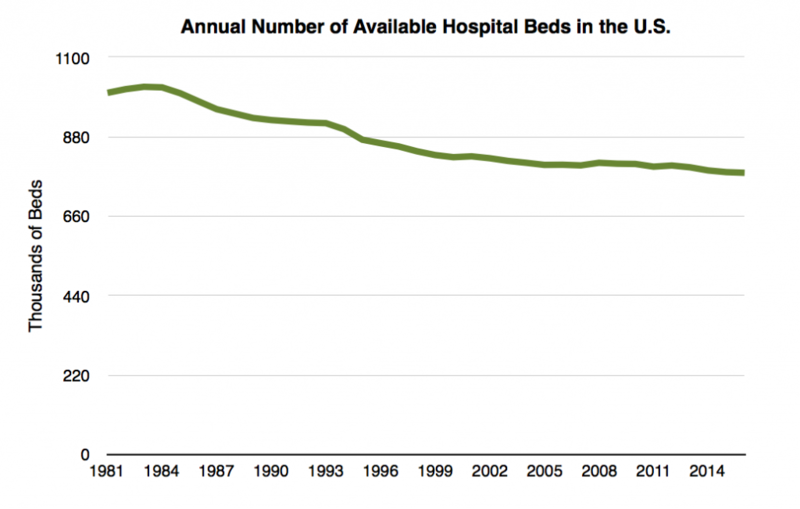 Figure 18: the number of hospital beds available in the U.S. dropped by 22% since 1981 indicating that, not only are there fewer hospitals in this country, the hospitals remaining have downsized somewhat. Figure 19 is again derived from data from California’s OSHPD and shows that even skilled nursing facilities (at least in California) have seen a drop in utilization since 2000. Both total annual censuses and long term custodial censuses (for the chronically debilitated) have declined slightly for California’s SNFs between 2000 and 2016. 1. An increased scrutiny over admissions criteria by both CMS and the private insurance companies starting with the initiation of Diagnostic Related Groups criteria for admissions in 1984. 2. 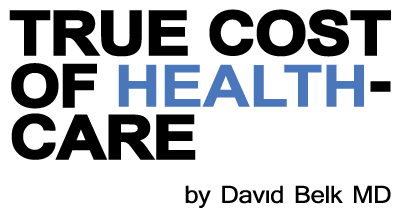 The availability of better outpatient medical care. 3. The availability of more effective prescription drugs due to both the development of such drugs and, more recently, the fact that most prescription drugs in the U.S. are now generic and inexpensive. 4. The fact that more people are choosing to receive their end-of-life care outside of a hospital due to the increasing use of hospice programs. 5. Improved surgical techniques have also undoubtedly played a role by increasing the proportion of surgeries that can be done as outpatient procedures. The fact that the total number of surgeries performed in the U.S. has been flat for nearly two decades is certainly curious, but is also likely due to improved non-surgical care in the U.S.
That SNF censuses also appear to be declining, or at least not increasing is rather surprising given the fact that California’s population has grown and aged significantly since 2000. A likely explanation for this trend is the increased availability of in home support services for people who previously would have stayed in a SNF.